Former world champion Fernando Alonso has left McLaren after agreeing an early release from his contract. McLaren and Alonso have had an acrimonious relationship this season and a team statement said that both parties had "agreed to move on". Alonso is free to join another team in 2008, and his agent said neither party would pay a financial penalty. Red Bull and Renault are the favourites to sign him, and BBC Sport understands Red Bull are the more likely option. 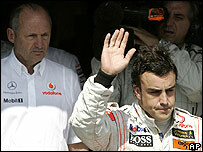 Alonso's relationship with McLaren soured following a series of rows with team boss Ron Dennis this season. McLaren described the split as a "mutual parting of the ways", adding: "Both parties believe that this was the right decision. Alonso said: "Since I was a boy I had always wanted to drive for McLaren, but sometimes in life things do not work out. I continue to believe that McLaren is a great team. "Yes, we have had our ups and downs during the season, which has made it extra challenging for all of us, and it is not a secret that I never really felt at home. "I know there have been suggestions of favouritism within the team and people say a lot of things in the heat of battle, but in the end I was always provided with an equal opportunity to win." Dennis added: "He is a great driver but for some reason the combination of McLaren-Mercedes and Fernando has not really worked out, and in the end we reached a stage where none of us could find a way to move forward." It is not known who will replace Alonso as Lewis Hamilton's team-mate, but Williams's Nico Rosberg and Renault's Heikki Kovalainen are the favourites. 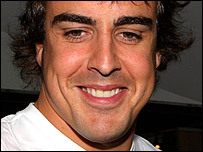 Alonso finished 2007 tied on points with team-mate Lewis Hamilton and only one adrift of Raikkonen. He joined the team this season on a three-year contract worth a total of 50 million euros (£34.7m). But he spent much of his time at McLaren under a cloud. His initial misgivings about the level of support McLaren were giving to Hamilton, who was in his debut season this year, soon degenerated into a series of rows with Dennis. These became public in the course of the spy scandal that rocked the sport this season, when McLaren were fined $100m (£49.2m) and thrown out of the constructors' championship after being found guilty of being in possession of confidential Ferrari documents. Alonso became central to the story when, in a row with Dennis at the Hungarian Grand Prix in August, he threatened to reveal incriminating e-mails to governing body the FIA. Although Alonso soon apologised, Dennis had already phoned FIA president Max Mosley himself, starting the chain of events that led to McLaren's punishment. Following those events, the relationship between Hamilton and Alonso also deteriorated, with both saying they would rather not partner the other again for another season. Both men later said the antagonism between them had been overplayed by the media. It has been widely speculated that wherever Alonso ends up next season, it will be for only a year before moving to Ferrari. Ferrari last month extended Felipe Massa's contract to 2010, which appeared to end the possibility of Alonso joining in 2009 because Raikkonen is also contracted to the team for another two years. But Ferrari president Luca di Montezemolo is known to be a fan of Alonso, and said after the conclusion to the championship last month: "Alonso is world-class in every sense. "I have appreciated very much his sportsmanship. He lost by one point and I believe it wasn't his fault." It is possible that a vacancy could be made for Alonso by paying up Massa's contract at the end of next season.